UPDATED: Wed., Aug. 29, 2018, 5:51 p.m.
HELENA – A judge is expected to make a ruling this week on whether the first grizzly bear hunting season to be held in the Lower 48 states in more than four decades will open as scheduled on Saturday outside Yellowstone National Park. 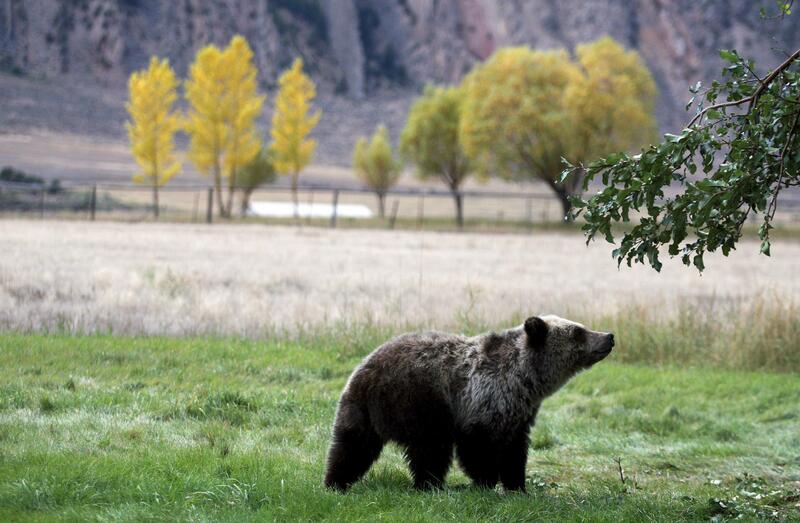 Wildlife advocates and Native American tribes will appear in court Thursday to urge U.S. District Judge Dana Christensen to reinstate federal protections that were lifted last year for approximately 700 grizzlies living in and around Yellowstone. They are asking him to do so before the hunts begin this weekend in Wyoming and Idaho. Wildlife officials in Wyoming and Idaho say they’re ready for opening day. Twelve hunters in Wyoming and one in Idaho have been issued licenses for Saturday’s opening out of the thousands who applied. It would be Wyoming’s first hunt since 1974 and Idaho’s first since 1946. “We’re just waiting for the judge’s decision,” said Roger Phillips, spokesman for the Idaho Department of Fish and Game. Tens of thousands of grizzly bears once roamed the Lower 48 states, but hunters killed most of them in the 19th and early 20th centuries. The population of grizzlies living in Yellowstone dipped to just 136 before it was classified with the rest of the Lower 48 states’ grizzly bear populations as a threatened species in 1975, a decision that protected them and their habitat and allowed the long, slow process of recovery. The threatened species designation doesn’t apply to Alaska, where bear hunts are held each spring and fall and the population numbers about 30,000. There, fall hunters carrying high-powered rifles track grizzlies, also called brown bears, through areas with good food sources as the bears look to fatten up before they settle in their dens for winter. The U.S. Fish and Wildlife Service first declared success in Yellowstone in 2007, but a federal judge ordered protections to remain in place while wildlife officials studied whether the decline of a major food source, whitebark pine seeds, could threaten the bears’ survival. In 2017, the federal agency concluded that it had addressed that and all other threats, and ruled that the grizzlies living across 19,000 square miles of the Yellowstone area in Montana, Idaho and Wyoming were no longer a threatened species. That decision turned management of the bears over to the three states, who agreed on a plan that set hunting quotas based on the number of deaths each year to ensure the population stays above 600 animals. Idaho’s hunting quota is one bear. Wyoming’s hunt is in two phases: Sept. 1 opens the season in an outlying area with a quota of 12 bears, and Sept. 15 starts the season in prime grizzly habitat near Yellowstone and Grand Teton national parks. One female or nine males can be killed in those areas. Montana officials decided not to hold a hunt this year. Bear hunting is not allowed in Yellowstone or Grand Teton. “The science shows there can be a hunt and we can continue to have a recovered and viable population of grizzly bears for generations to come,” said Renny MacKay, spokesman for the Wyoming Game and Fish Department. The wildlife advocates and tribes suing the U.S. government dispute that, and they have filed nearly two dozen arguments for why protections should remain for Yellowstone’s iconic predators. With six consolidated lawsuits filed by 27 plaintiffs, the arguments are complex but boil down to two major themes: There are still threats against bears that the federal agency didn’t adequately consider and the plaintiffs don’t trust the states will ensure their survival. Department of Justice lawyers representing the Fish and Wildlife Service rebuff the plaintiffs’ claims and say the Yellowstone grizzlies are one of the most-studied and best-managed bear species in the word. Christensen has said he’ll rule before Saturday, but that ruling likely won’t be the end of the matter. An appeal is likely by whoever is on the losing side. “It’s already drafted and ready to go,” Bishop said. The grizzly population also has rebounded north of Yellowstone in Montana’s Glacier National Park and Bob Marshall Wilderness. The Fish and Wildlife Service has been moving toward lifting federal protections for that group of approximately 1,000 bears, but first wants to see how Christensen decides the Yellowstone case. Other populations of grizzly bears that were included in the 1975 threatened species listing haven’t recovered as well. There are about 40 bears in the Cabinet-Yaak population of northwestern Montana, and small populations of grizzlies in Washington’s North Cascade and Selkirk mountains. There are no longer any grizzlies in Idaho and Montana’s Bitterroot Mountains, which are considered prime habitat and a potential home for relocated bears. Published: Aug. 29, 2018, 4:03 p.m. Updated: Aug. 29, 2018, 5:51 p.m.